Spain Takes In Migrant Ship Stranded After Italy, Malta Refused To Let It Dock A rescue ship picked up more than 600 migrants off the coast of Libya, and was left stranded after Malta and Italy turned it away. Italy's new government has vowed a tougher stance on immigration. The Aquarius, a former North Atlantic fisheries protection ship now used by humanitarian groups SOS Mediterranee and Medecins Sans Frontieres (Doctors Without Borders), is seen in December 2017 during a rescue operation in the Mediterranean Sea. 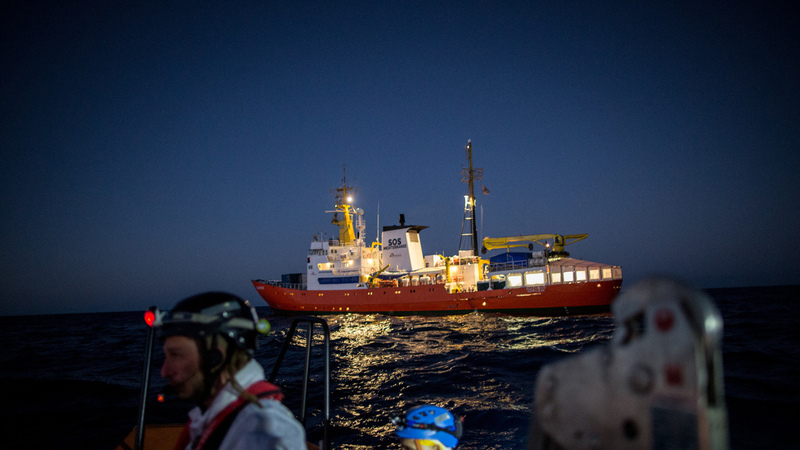 The rescue ship was stranded this weekend after Italy and Malta refused to allow it to dock. A rescue ship carrying more than 600 migrants will be allowed to enter the Spanish port of Valencia, after it was turned away from ports in Italy and Malta. The ship Aquarius rescued 629 people in the Mediterranean Sea on Saturday, "including 123 unaccompanied minors, 11 other children and seven pregnant women," Reuters reports. The ship was left stranded at sea over the weekend after it was denied access to the Italian and Maltese ports. Italy, which has a new, anti-immigration government, suggested that Malta take in the migrants. Malta objected, saying that it had been Italian authorities who coordinated the rescue to begin with, The Associated Press writes. Aid workers aboard said that food would run out by the end of the day on Monday, The Associated Press reports, and they reported injuries ranging from burns to hypothermia. The U.N. refugee agency said Monday that there was "an urgent humanitarian imperative" to act, calling on governments to accept the distressed migrants now and resolve "broader issues" later. Spain answered the call, opening the port of Valencia to the vessel, Lucia Benavides reports for NPR from Barcelona. But AP notes that "it wasn't immediately clear if such a voyage was feasible given the distances involved — the ship is now more than 1,400 kilometers (over 750 nautical miles) from Valencia." The number of migrants arriving in Spain has been on the rise, Benavides reports, while the number of sea arrivals in Italy "has dropped 77 percent compared to this time last year, following controversial deals with the Libyan Coast Guard and investigations into NGO search-and-rescues." Italy's government is led by two populist parties tied together, in part, by hostility toward migrants and a desire for a tougher stance on immigration. A little more than a week ago, Italy's new interior minister, Matteo Salvini, told a crowd that "Italy and Sicily cannot be Europe's refugee camp" and "the good times for illegals are over," Deutsche Welle reports. Closing Italy's ports to Aquarius represented the first test of the populist government's rhetoric, and Italy stood firm, despite outcry from the European Union and the U.N.
"The International Convention for the Safety of Life at Sea dictates that any ship learning of distress at sea must assist regardless of the circumstances. "It says that the country responsible for operations in that area has primary responsibility for taking them from the ship. "It also clearly states that the relevant government "shall arrange for such disembarkation to be effected as soon as reasonably practicable". "Given that the migrants were rescued off the coast of Libya, the closest ports are likely to be either Sicily in Italy or Malta." Italy has long protested that sending migrants to the nearest port has distributed Europe's burden unequally, hitting Italy particularly hard. It's an argument that human rights advocates also have supported. "It's the only way, he said, to make ourselves heard in Brussels. "Many commentators attribute the populists election success to the European Union's failure to assist Italy in handling the migrant crisis." Spain, which announced Monday that it would accept the ship, is also led by a brand-new government, after a no-confidence vote in the former prime minister put the Socialists in power on June 1. The new prime minister said Spain was welcoming the Aquarius out of the "duty to avoid a humanitarian disaster," the AP reports.